In the first half of the presentation, Joshua Burgess explains how the Nextera DNA Flex (Illumina; San Diego, CA) represents the next era in library prep and has a lot of advantages over traditional library prep methods for WGS. The foundational technology is the bead-linked transposome that saturates at 100 ng, so any additional sample input falls off. This means that you do not need the same level of rigor in quantification, and still have a normalized sample integration at the output. This technology is flexible enough to support human WGS with ultra-low DNA input samples, and is supportive for bacterial WGS and metagenomics. The real advantage to this kit, however, is with the direct sample input, because you can go from a raw sample, such as saliva, to a library in 3.5 hours, and get consistent data from sample to sample. This is a very novice-friendly protocol. In a collaborative study by Illumina with DNA Genotek, the data showed Oragene and Nextera DNA Flex are compatible and offer a solution to direct-to-assay WGS. Illumina collected fourteen saliva samples in Oragene self-collection kits (DNA Genotek; Kanata, ON) stored at ambient temperature. Thirty (30) µl by volume of Oragene/saliva raw sample was added directly into the Nextera DNA Flex workflow, completely skipping a quantification step. All samples were super-saturated exceeding the 100 ng amount, with actual DNA quantities ranging from 174 ng-2084 ng in the 30 µl aliquot. Libraries of similar yields were successfully produced with 13% CV, ready for WGS. In the latter half of the presentation, Dr. Iwasiow focused on the attributes of Oragene that make saliva a particularly well-suited source of DNA in sequencing studies. The main source of DNA in saliva is the same as that in blood, with ~70% of DNA coming from white blood cells. With Oragene kits, the extracted DNA is very high quality and quantity with on average median yield of 48 µg per 2 ml saliva sample. Oragene/saliva samples are stable at ambient temperatures and are a painless, non-invasive, and easy collection method that dramatically increases study compliance. Since saliva is considered an exempt human specimen, it’s a cost-effective means of shipping a sample in the post without any need for cold chain logistics. Finally, and importantly, the bacterial content in Oragene-collected saliva is very low (on average ~11%) and this bacteria is neutralized once collected in Oragene. 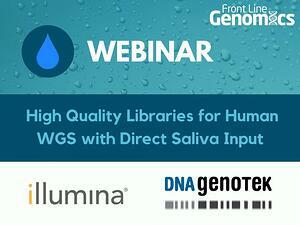 This means any bacteria present in a saliva sample does not grow or degrade the human DNA sample. Collections with Oragene saliva kits will increase donor compliance and reduce the costs and complexities associated with DNA collection, transport and storage. Listen to full version by watching the webinar re-play at your convenience. As always, we look forward to hearing your thoughts and opinions in the spaces below. If you would like to try Oragene saliva collection kits for your own project, please request complimentary trial kits.